RobotMower.org is an ecommerce site allowing the user to buy robotic mowers and pay by credit card. One of the main challenges with this site was to create a design to showcase a product that many users may not have seen before or know about. Structuring the website in a way that quickly shows the site visitor what the product can do and how it can be of benefit were the main goals. We used a slideshow of You Tube videos to show robotic mowers in action in different scenarios such as commercial Irish companies or residential. 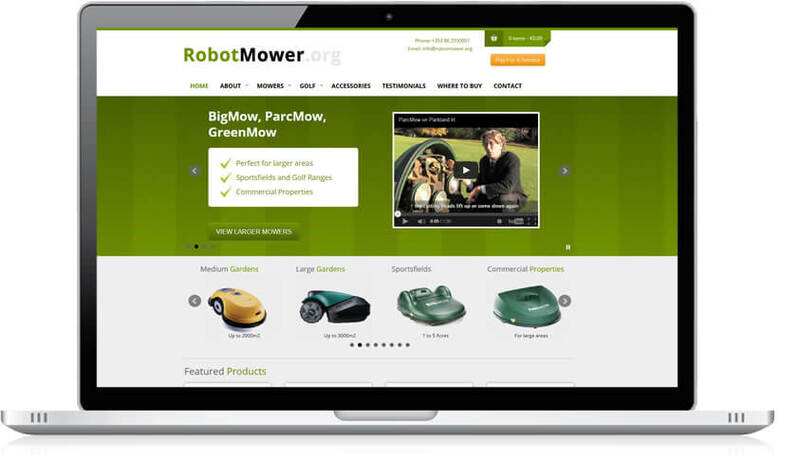 Once the user has found their robotic mower or accessory they can add it to the cart and checkout securely. One of the major ecommerce recommendations is to let users checkout quickly and easily. This website certainly does that. We create many different types of ecommerce sites as some of our customers wish to ship internationally, accept payments through PayPal, Stipe, Realex, WorldPay, WorldNet or Sage Pay. We have implemented all of these credit card processing systems. If you need inventory management, multiple product variations and prices or advanced shipping options we can also cater for this. Call us to discuss your requirements.